Ten years after the Crimean War, another bloodbath awaited a nation still barely out of its independence and still conquering new lands, with already a burgeoning industry confined in the northeast of the continent. 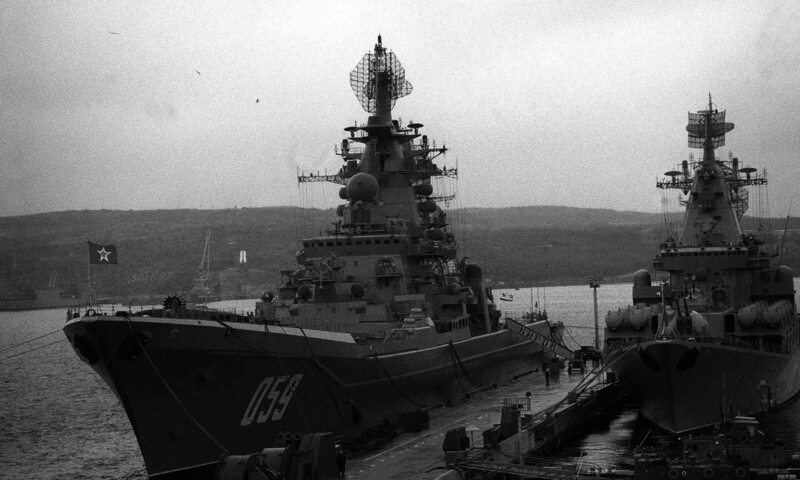 It will be in terms of naval matters also rich with the invention of the Monitor, a variation on the theme of armored riverine warfare, but also introducing modern rifled guns and breech-loaded, shells, mines, spar torpedoes and submersibles. The conflict is rooted in strong economic, industrial and cultural differences and disparities between North and South. The tension rose about slavery, which was the major sticking point between these states, as the Industrial north did not need it (but freed workforce) and pushed for abolition, while the agricultural South was totally dependent of its perpetuation. New legislation in the North (abolitionist states now have the majority in Congress) were perceived by southern states as a future threat to slavery. More importantly, with the election of Abraham Lincoln in 1860, also hostile to slavery, Southern states eventually decided to withdraw from the Federation, led by Jefferson Davis. However, if the disparity of resources is overwhelming, the south has brilliant officers (as Robert E. Lee) and sheer determination against the Union to save their own way of life. The confederation was formed of seven states (South Carolina, Texas, Louisiana, Alabama, Mississippi, Florida, Georgia) while bordering states being torn apart and a wall of hate raised since the declaration of Lincoln calling it illegal secession. 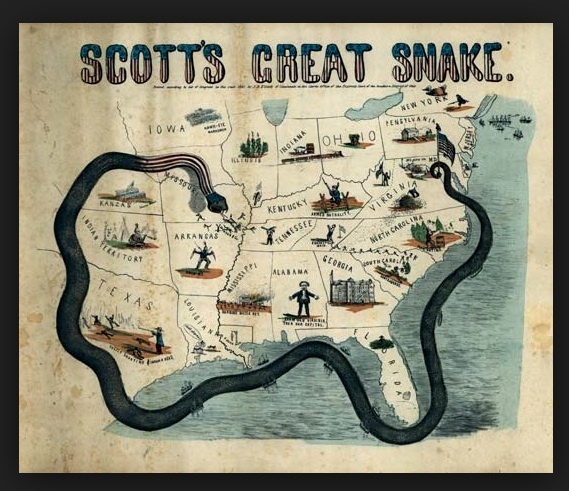 Soon after that, and also facing the foreign delegation, the Confederacy was assimilated as a rebellion by the north, hence the name “secession war”. Fort Sumter bombardment. It was the very opening of the four years event that turned a young growing nation apart, into its bloodiest civil war ever. While attempting to resupply Fort Sumter, a Federal garrison (“northerner”) in South Carolina, the Union troops were taken to task by the Confederates. 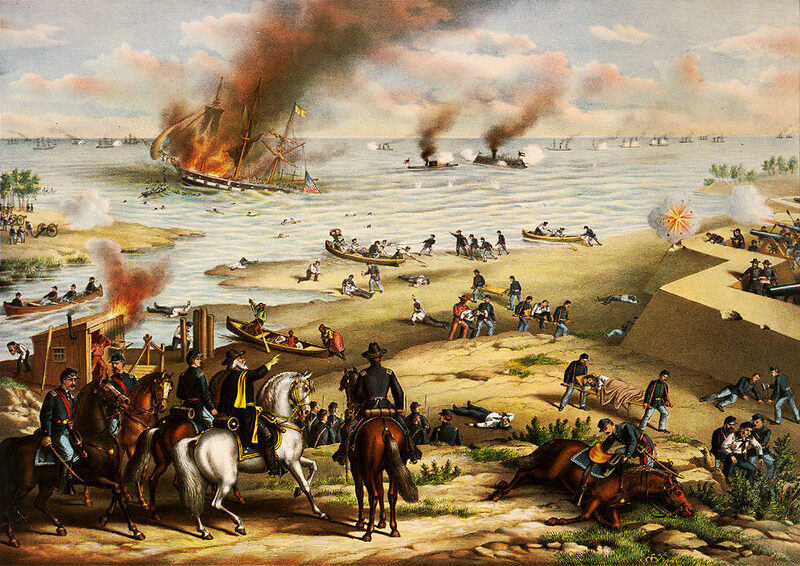 War broke out this April 12, 1861. The Southern officers, heirs to a long military tradition proved more likely to train their troops that the North, which begins with rake in reverse: At the battle of Bull Run, the Union troops were defeated by those of General Beauregard. The North, however, manages to be a “glaze” with the border states, until very mixed, or neutral. The unions would suffer a second defeat in the “battle of seven days” in the east, and then occurred the second battle of Bull Run led this time by Lee, who drove the Union in the North, marching on Washington. Aware of the seriousness of the situation, the North threw all his strength to Antietam (September 17, 1862). The losses were terrible on both sides, forcing Lee to beat a retreat temporarily. In December, the troops of Burnside Yankees are trying to take the fortified positions of Lee in Virginia and at Fredericksburg, without success. From the mid-62, the Union general Ulysses S. Grant success as making a breakthrough on the Mississippi River to cut the Confederacy in two. 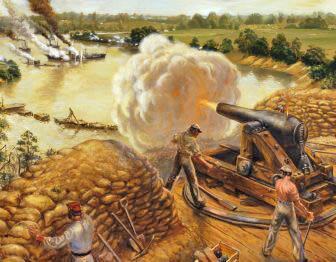 Late 1862, he stumbled on Vicksburg strongpoint, which was left under a punishing artillery siege. To the east, in May 1863, Lee defeated the Union again at Chancellorsville, a pyrrhic, costly victory, where he lost many men including his best general, Stonewall Jackson. He crossed Pennsylvania and met the Union forces at Gettysburg in July 1863, the turning point of the war. This was his first defeat, and he blamed himself in face of his men to have underestimated the union defense. The Union at the same time, guaranteed itself sturdy access to southern Mississippi by eventually taking Vicksburg. A new battle, this time with the Confederates in full retreat, was committed near Chattanooga in November. It was a decisive victory for the Union, opening the gates of Alabama and Georgia. 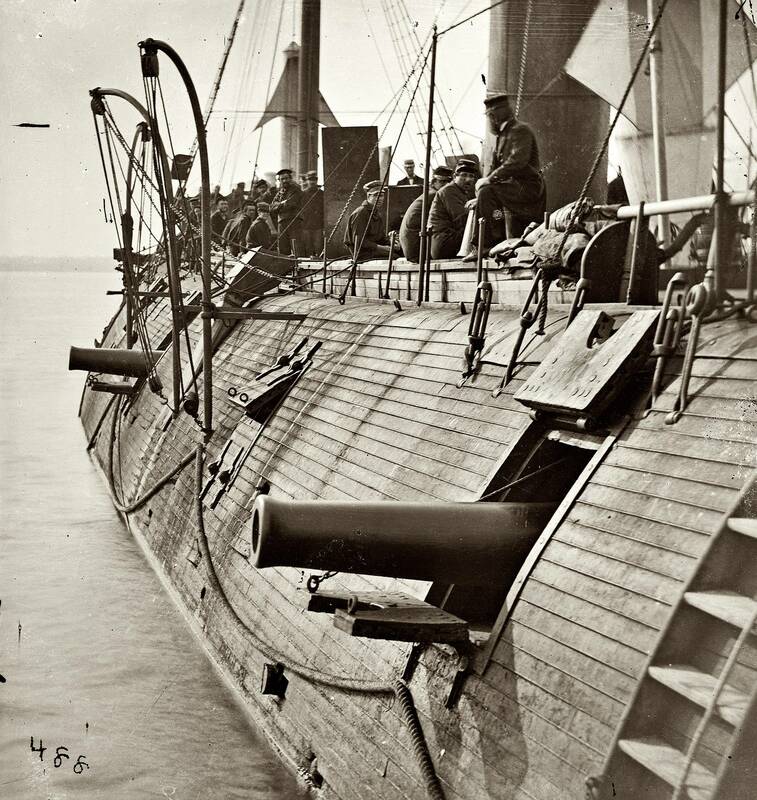 River ironclad USS Pittsburgh, 1861In 1864, Grant was appointed by Lincoln at the head of Union forces. Assisted by Sheridan and Sherman, he will conduct a major offensive on three fronts, with the aim of Atlanta, Richmond, and to cut off the retreat of Confederate and supplies. Grant faces Lee and the bulk of the Confederate in the forests of the Wilderness 5 and 6 May 1864, and both sides suffered heavy losses.Grant continues to advance to Spotsylvania Courthouse, but it was a new bloody stalemate. Meanwhile, in the Shenandoah Valley, Sheridan and Sherman in two successful battles at Atlanta deprived the South of their main sources of supplies. The Confederates attempted a daring manoeuver but were finally defeated at Nashville in December. Sherman began a march to the sea in April 1865, seizing the railway line from Richmond. 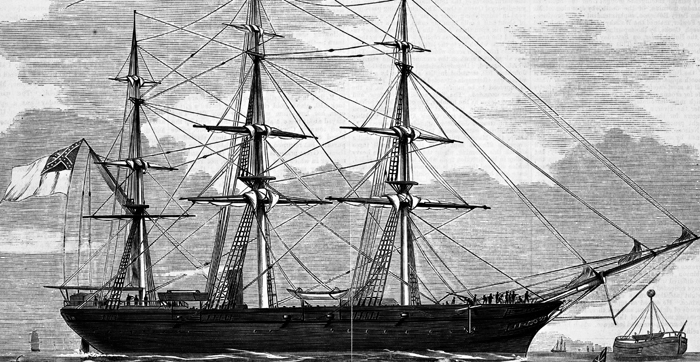 The CSS Shenandoah was one of the most successful Confederate raider. Lee was forced to retreat in North Carolina, thinking replenish its forces, but it was surrounded by Grant at Appomattox, and forced to surrender on April 9. Therefore, with their best general made prisoner the confidence of the Southerners was broken, and the entire confederation surrendered shortly after. Ships bombarding Vicksburg on the James River… No war has seen so many riverine ships used in such tactical and strategic way. The Mississippi, as well as the biggest and longest rivers in the world, was by far both a lifeline and a natural frontier. Necessities came to protect the ships against artillery with wood and iron plates sandwiches which ultimately led built riverine Ironclads, and then the monitor, a concept which lasted until the second world war. On the naval plan, the absolute superiority of the North ship and industrial resources enabled him early on to impose a naval blockade southerners largely dependent on its exports to Europe. Similarly, the North was opposed on behalf of the Union representing the majority of Americans, Europeans to build and sell in the south of ships, including battleships that were lacking in the North (one on duty). The Confederates, in fact, bought several buildings, but none was able to join his forces before the end of the conflict. Other routes were permitted, including that of “blockade runners” fast ships requisitioned, and hastily armed with artillery, but also mixed clippers and merchant ships that turned into corsairs. The Shenandoah and Alabama were the most famous of them. On the other hand, the Confederates sought new and creative ways to break the blockade. They built many battleships, theoretically invulnerable to the Union frigates volleys, at river and at sea, the most famous was the Merrimack (ex-Virginia). She went up the East Coast in 1862 and came running from Norfolk Southern Building in Hampton Roads. There he was opposed to northerner Monitor, the famous “cheesebox on a raft” of the great Ericsson. 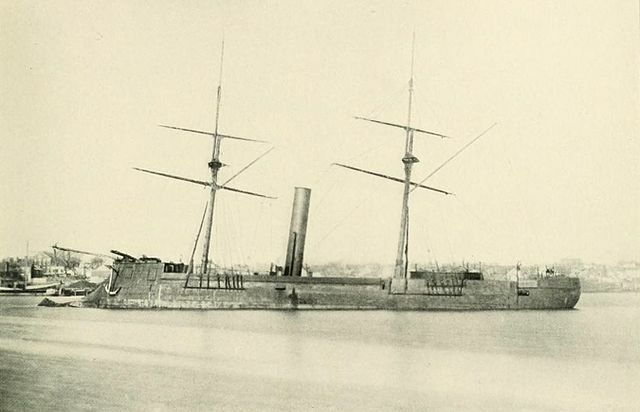 CSS Stonewall, the only sea going Confederate ironclad, built in Bordeaux but never arrived in time to take part in the hostilities. Instead she became the first Japanese ironclad, blooded in the Boshin war. Many of these “river cruisers” were armed by both sides, as to take control of the rivers was capital, particularly the Mississippi and its tributaries like the James River, whereas a naval battle with ships entirely of this type occurred. A desperate situation generated strange vessels like the ram Stonewall Jackson, with its iron and wood turtleback, also the CSS David, a semi-submersible torpedo boat, and especially the HS Hunley, first submarine propelled by human power, were daring avant-garde concepts turned into immediate use. Nothing shows more the discrepancy between the Confederates and the industrial northern Union than naval might. The immense majority of ships in service by then were located in ports and arsenals remaining firmly in the union’s hands. So much so that its first immediate use was to set up and easily enforce a blockade of the South, preventing any exports and therefore to strangle it economically. And indeed, at large, the blocus was largely successful and the Confederates by all times faced a David vs Goliath contest were only the bold, the daredevils and the innovators thrives. Not only the South created an array of riverine ironclads but also submersibles and spar-torpedo or rams semi-submerged, but they also convert all the remaining civilian clippers they hold as commerce raiders, forcing the blockade and destroying Union ships along the way to and from Europe. 10 smaller corvettes (1851-59) 1020-1488t, variable. In construction (since 1842, modified but never launched: The Stevens battery.